CM Magazine:What Is Canada? The Ultimate Canadian Quiz Book. What Is Canada? 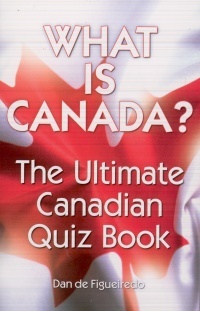 The Ultimate Canadian Quiz Book. Edmonton, AB: Blue Bike Books (Distributed by Lone Pine), 2008. What British-born Canadian writer and naturalist is credited with the following quotation, which in the light of events now, seems ironic, Behind me I had the power of 10,000 miles of wilderness, trees that have never told a lie, though some of them have stood for 2000 years? Its 392 pages filled with 713 questions and answers, What Is Canada? has quiz questions to meet the interests of every Canadian. What is more, those pages are laid out with generous white space, comfortably large fonts and specially-commissioned illustrations, caricatures and cartoons by a cast of six Canadian illustrators. Questions and answers are always paired on the front and back of the same page, thus eliminating the need for flipping from the front to back of the book or chapter. This is a nicely produced work with a good sense of humour and plenty of well-researched questions and answers. It also is intended for the adult book market. This is demonstrated equally by the size of the book and by questions on Robertson Davies' off-duty ruminations on Canadian identity and the literary works of Reverend George Munro Grant. Some kids will love it, perhaps. Perhaps some kids will read it obsessively. Far more likely, the book will become a resource for people looking for a few unusual facts about the typical topics of Canadian studies, including geography, literature, First Nations, history in all of its varieties, sports, current affairs or virtually any other subject. Whether a student is completing a project and wants a few additional facts, or a teacher is setting a fun quiz, What is Canada? will meet the bill. And then some. The answer to the above question is C, Archibald Belaney. And it is a tribute to the enthusiasm of the author that the answer key includes one of his frequent paragraphs of explanation and elucidation: Belaney was of course known more famously as Grey Owl. As Grey Owl, he lived the life of an Aboriginal and dressed the part as well. He grew his hair long and wore Native clothing. Belaney claimed his father was Scottish and his mother was Apache. He was an eloquent speaker who made numerous lecture tours across North America and, to his credit, wrote books on the need to preserve the forests, wildlife and Native culture. It was only discovered after his death in 1938 that he was in fact an Englishman, born in Hastings. This is not just a quiz book. Its an education. Greg Bak is a an archivist with Library and Archives Canada in Ottawa.